The mother and housemate of a slain 20-year-old University of Mary Washington student gave dramatic testimony as the trial of her accused killer began Monday. Steve Briel is charged with the April 17, 2015, slaying of Grace Mann in Fredericksburg, Virginia. He pleaded not guilty to charges of first-degree murder, strangulation and abduction. Police say Briel, a part-time student at Mary Washington, strangled Mann to death in the home they shared with two other women near campus. He was still in the house when the two other housemates came home and discovered Mann's body. Melissa Mann and many in the courtroom were in tears as she testified about getting the call about her daughter's death. "I was pretty hysterical," she said. "I just kept saying, 'She's dead?'" Holly Aleksonis and another housemate returned home to find Briel drenched with sweat and speaking very quickly. 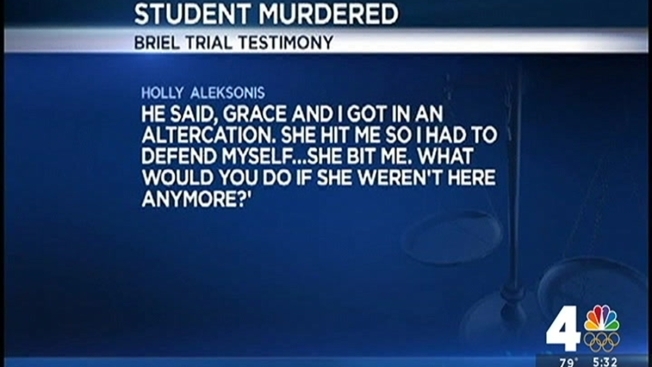 Aleksonis testified he stood before a closed bedroom door and said, "Grace and I got in an altercation. She hit me so I had to defend myself ... She bit me. What would you do if she weren't here anymore?'" Aleksonis opened the door and saw her purple comforter on the floor. "I pulled the comforter off," Aleksonis testified, "and Grace was there with a plastic bag over her head. I pulled it off and screamed and ran from the room." As many in the courtroom sobbed, prosecutors played the 911 call from Aleksonis that day. She was so distraught, the dispatcher had trouble getting information until Aleksonis finally shouted, "My roommate strangled her!" Last year, Briel's attorney said an insanity defense would be used for his murder trial. The attorney will try to show his client suffered from severe mental illness and was insane at the time of the crime. In the defense's opening statment, Briel's attorneys said their expert psychiatrist found Briel suffered from paranoid schizophrenia and last April imagined there was a global conspiracy and became convinced Mann was somehow a threat to him. One night while texting with his mother, she told him to calm down and say Hail Marys and he texted back, "So it's Hail Mary Full of GRACE," the defense said. Briel's mother was the first person he texted after the homicide, writing, "I've made a MESS What should I do? Run?" To which Briel's mother replied, "Yes, get out of the there." Briel changed his clothers and shaved his face before leaving, which prosecutors argued is not the act of someone who is insane. Prosecutor LaBravia Jenkins told jurors she'll counter that theory. "What they are going to try to convince you is he was sane, then he was insane for 30 minutes, then he was fine," she said. "I suggest to you that's ludicrous." Mann's female housemates said Briel behaved strangely just before they came home. One of the women said she received a text message from Briel asking when she and another roommate would be home. He allegedly wrote, "I was in [victim's roommate]'s room and I made a mess." When the women arrived at the home, they found the door to that bedroom closed. The two knocked, and a sweaty, fast-talking Briel emerged. The women then described finding Mann's body under a purple comforter; a plastic grocery bag was over her head, and several were stuffed into her mouth. One of the roommates testified that in the days leading up to Mann's death, Briel sent an insistent text message asking for a blanket back. Mann was a well-known activist on campus and helped lead a group known as Feminists United. The exact motive in the case remains unclear, but many have tried to link Mann's killing to her involvement in the group. Earlier this year, the U.S. Department of Education launched a civil rights investigation into the university. Feminists United said that some of its members -- including Mann -- had been threatened on the social media site Yik Yak, and that the university didn't do enough to investigate the threats. Yik Yak allows users to remain anonymous and is popular on college campuses. Mary Washington President Richard V. Hurley has said there is no evidence to support that Mann's killing was linked to the social media attacks.